Pick up your pace with this time saving essential and get thermal defence, versatile hold and faster styling in one spritz. Paul Mitchell Express Style Hot Off The Press is quick drying, speeds up styling time and protects your hair during heat styling. Using rice hull extracts, Paul Mitchell Express Style Hot Off The Press builds a weightless barrier between fragile strands and damaging heat tools, while wheat proteins deliver an extra dose of strength. It’s multi purpose humidity resistant formula grips and controls during heat styling to offer flexible hold for finished styles, perfect for creating effortless curls or straight lines with a hot iron. Spray onto dry hair before using a hot iron. Spray to finish if needed. Had my hair done at hairdressers and they used this product so I brought some from here,so pleased with it. Have curly hair that I straighten most days and this is the best product for it. Leaves hair silky smooth and so soft. Would highly recommend and will not be going back to ant other product now! Horrible, didn't work for me! I have 2b/2c curls, thick yet fine. I regularly straighten my hair. I asked the hairdresser to refer me to a styling spray to protect my hair from heat damage. I bought this and I was very disappointed. It stuck to my hot iron. Never again. Best heat protector I've ever used. Light and a little goes a long way. Smells lovely and makes hair shiny! Awesome product, I have pin straight hair that is so soft it struggles to hold curls. This product really does make the curls last all day and night! Nice product that tames my unruly hair. Not smelly,heavy or sticky. Have used many products with my straighteners, but by far, Paul Mitchell Express Style Hot Off The Press is the best. Would, and have recommended to others. 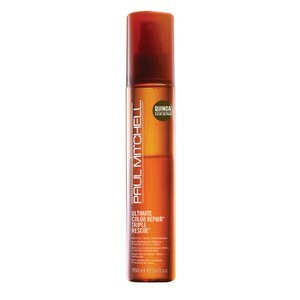 Paul Mitchell Express Style Hot Off The Press (200ml) is a great item for using with my hair straighteners. Value for money, lasts ages.